Symbolism was a late 19th century European movement of French and Belgian origin in poetry and other arts. It overlaps significantly with the Decadent movement and the Aesthetic movement and was present all over Europe and Russia. Jean Moréas coined the term symbolisme in the Symbolist Manifesto (1886). Symbolism was largely a reaction against Naturalism and Realism, movements which attempted to objectively capture reality. These movements invited a reaction in favour of spirituality, the imagination, and dreams; the path to Symbolism begins with that reaction. Some writers, such as Joris-Karl Huysmans, began as naturalists before moving in the direction of Symbolism; for Huysmans, this change reflected his awakening interest in religion and spirituality. The Symbolist movement in literature has its roots in The Flowers of Evil (The Flowers of Evil) by Charles Baudelaire. The aesthetic was developed by Stephane Mallarmé and Paul Verlaine during the 1860s and '70s. During the 1880s, the esthetic was articulated through a series of manifestoes and attracted a generation of writers. The works of Edgar Allan Poe, which Baudelaire greatly admired and translated into French, were a significant influence and the source of many stock tropes and images. Distinct from the Symbolist movement in literature, Symbolism in art represents an outgrowth of the more gothic and darker sides of Romanticism; but where Romanticism was impetuous and rebellious, Symbolist art was static and hieratic. In this art, scenes from nature, human activities, and all other real world phenomena will not be described for their own sake; here, they are perceptible surfaces created to represent their esoteric affinities with the primordial Ideals. The Symbolist poets wished to liberate techniques of versification in order to allow greater room for "fluidity", and as such were aligned with the movement towards free verse, a direction very much in evidence in the poems of Gustave Kahn. Symbolist poems sought to evoke, rather than to describe; symbolic imagery was used to signify the state of the poet's soul. A noir, E blanc, I rouge, U vert, O bleu : voyelles. . .
— both poets seek to identify one sense experience with another, although it seems that neither of them actually experienced synesthesia (see List of people with synesthesia). Of the several attempts at defining the essence of symbolism, perhaps none was more influential than Paul Verlaine's 1884 publication of a series of essays on Tristan Corbière, Arthur Rimbaud, Stéphane Mallarmé, Marceline Desbordes-Valmore, Gérard de Nerval, and "Pauvre Lelian" ("Poor Lelian", an anagram of Paul Verlaine's own name), each of whom Verlaine numbered among the poètes maudits, "accursed poets." Verlaine argued that in their individual and very different ways, each of these hitherto neglected poets found genius a curse; it isolated them from their contemporaries, and as a result these poets were not at all concerned to avoid hermeticism and idiosyncratic writing styles. They were also portrayed as at odds with society, having tragic lives, and often given to self-destructive tendencies. These traits were not hindrances but consequences of their literary gifts. Verlaine's concept of the poète maudit in turn borrows from Baudelaire, who opened his collection Les fleurs du mal with the poem Bénédiction, which describes a poet whose internal serenity remains undisturbed by the contempt of the people surrounding him. In this conception of genius and the role of the poet, Verlaine referred indirectly to the aesthetics of Arthur Schopenhauer, the philosopher of pessimism, who maintained that the purpose of art was to provide a temporary refuge from the world of strife of the will. The Symbolist movement has frequently been confused with Decadence. Several young writers were derisively referred to in the press as "decadent" in the mid 1880s. Jean Moréas' manifesto was largely a response to this polemic. A few of these writers embraced the term while most avoided it. Although the æsthetics of Symbolism and Decadence can be seen as overlapping in some areas, the two remain distinct. Symbolism in literature is distinct from Symbolism in art although the two overlapped on a number of points. In painting, Symbolism was a continuation of some mystical tendencies in the Romantic tradition, which included such artists as Caspar David Friedrich, Fernand Khnopff and John Henry Fuseli and it was even more closely aligned with the self-consciously dark and private Decadent Movement. There were several, rather dissimilar, groups of Symbolist painters and visual artists, among whom Gustave Moreau, Odilon Redon, Pierre Puvis de Chavannes, Henri Fantin-Latour, Edvard Munch, Félicien Rops, and Jan Toorop were numbered. 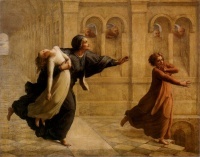 Symbolism in painting had an even larger geographical reach than Symbolism in poetry, reaching several Russian artists, as well as Elihu Vedder in the United States. Auguste Rodin is sometimes considered a Symbolist in sculpture. The Symbolist painters mined mythology and dream imagery for a visual language of the soul, seeking evocative paintings that brought to mind a static world of silence. The symbols used in Symbolism are not the familiar emblems of mainstream iconography but intensely personal, private, obscure and ambiguous references. More a philosophy than an actual style of art, the Symbolist painters influenced the contemporary Art Nouveau movement and Les Nabis. In their exploration of dreamlike subjects, symbolist painters are found across centuries and cultures, as they are still today; Bernard Delvaille has described René Magritte's surrealism as "Symbolism plus Freud". The period is best described in Dreamers of Decadence (1969) by Philippe Jullian. Symbolism had some influence in music as well. Many Symbolist writers and critics were early enthusiasts for the music of Richard Wagner, a fellow student of Schopenhauer. The Symbolist aesthetic had a deep impact on the works of Claude Debussy. His choices of libretti, texts, and themes come almost exclusively from the Symbolist canon: in particular, compositions such as his settings of Cinq poèmes de Baudelaire, various art songs on poems by Verlaine, the opera Pelléas et Mélisande with a libretto by Maurice Maeterlinck, and his unfinished sketches that illustrate two Poe stories, The Devil in the Belfry and The Fall of the House of Usher, all indicate that Debussy was profoundly influenced by Symbolist themes and tastes. His best known work, the Prélude à l'après-midi d'un faune, was inspired by a poem by Mallarmé, L'après-midi d'un faune. Aleksandr Scriabin's compositions are also influenced by the Symbolist aesthetic. Arnold Schoenberg's Pierrot Lunaire takes its text from German translations of the Symbolist poems by Albert Giraud, showing a link between German expressionism and Symbolism. Symbolism's cult of the static and hieratic adapted less well to narrative fiction than it did to poetry. Joris-Karl Huysmans' 1884 novel À rebours (English title: Against Nature) contained many themes which became associated with the Symbolist esthetic. This novel in which very little happens is a catalogue of the tastes and inner life of Des Esseintes, an eccentric, reclusive antihero. The novel was imitated by Oscar Wilde in several passages of The Picture of Dorian Gray. Paul Adam was the most prolific and most representative author of Symbolist novels. Les Demoiselles Goubert co-written with Jean Moréas in 1886 is an important transitional work between Naturalism and Symbolism. Few Symbolists used this form. One exception is Gustave Kahn who published Le Roi fou in 1896. Other fiction that is sometimes considered Symbolist is the cynical misanthropic (and especially, misogynistic) tales of Jules Barbey d'Aurevilly. Gabriele d'Annunzio wrote his first novels in the Symbolist vein. The same emphasis on an internal life of dreams and fantasies have made Symbolist theatre difficult to reconcile with more recent tastes and trends. Auguste Villiers de l'Isle-Adam's drama Axel (rev. ed. 1890) is a definitive Symbolist play; in it, two Rosicrucian aristocrats fall in love while trying to kill each other, only to agree to mutually commit suicide because nothing in life could equal their fantasies. From this play, Edmund Wilson took the title Axel's Castle for his influential study of the Symbolist aftermath in literature. Maurice Maeterlinck was another Symbolist playwright; his theatrical output includes both Pelléas and Melisande, and L'Oiseau Bleu ("The Blue Bird"), another theatrical fantasy. In the English speaking world, the closest counterpart to Symbolism was Aestheticism; the Pre-Raphaelites, also, were contemporaries of the earlier Symbolists, and have much in common with them. Symbolism had a significant influence on Modernism and its traces can be seen in a number of modernist artists, including T. S. Eliot, Wallace Stevens, Conrad Aiken, Hart Crane, and William Butler Yeats in the anglophone tradition and Rubén Darío in Hispanic letters. The early poems of Guillaume Apollinaire have strong affinities with Symbolism. . . .things that are dying—the whole belle-lettristic tradition of Renaissance culture perhaps, compelled to specialize more and more, more and mor e driven in on itself, as industrialism and democratic education have come to press it closer and closer. As the movement was losing its forward movement in France, after the turn of the twentieth century it became a major force in Russian poetry. The Russian Symbolist movement, steeped in the Eastern Orthodoxy and the religious doctrines of Vladimir Solovyov, had little in common with the French movement of the same name. It was the starting point of the careers of several major poets such as Alexander Blok, Andrei Bely, and Marina Tsvetaeva. Bely's novel Petersburg (1912) is considered the greatest monument of Russian symbolist prose. In Romania, Symbolists directly influenced by French poetry were first influential in the 1880s, when Alexandru Macedonski reunited a group of young poets around his magazine Literatorul. Polemicizing with the established Junimea and overshadowed by the influence of Mihai Eminescu, Symbolism was recovered as an inspiration in the 1910s, when it was voiced in the works of Tudor Arghezi, Ion Minulescu, George Bacovia, Ion Barbu, and Tudor Vianu, and held in esteem by the modernist magazine Sburătorul. The Symbolist painters were an important influence on expressionism and surrealism in painting, two movements which descend directly from Symbolism proper. The harlequins, paupers, and clowns of Pablo Picasso's "Blue Period" show the influence of Symbolism, and especially of Puvis de Chavannes. 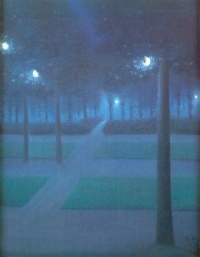 In Belgium, where Symbolism had penetrated deeply, so much so that it came to be thought of as a national style, the static strangeness of painters like René Magritte can be seen as a direct continuation of Symbolism. The work of some Symbolist visual artists, such as Jan Toorop, directly impacted the curvilinear forms of art nouveau. Many early motion pictures, also, contain a good deal of Symbolist visual imagery and themes in their staging, set designs, and imagery. The films of German Expressionism owe a great deal to Symbolist imagery. The virginal "good girls" seen in the films of D. W. Griffith, and the silent movie "bad girls" portrayed by Theda Bara, both show the continuing influence of Symbolist imagery, as do the Babylonian scenes from Griffith's Intolerance. Symbolist imagery lived on longest in the horror film; as late as 1932, a horror film such as Carl Theodor Dreyer's Vampyr shows the obvious influence of Symbolist imagery; parts of the film resemble tableau vivant re-creations of the early paintings of Edvard Munch. Unless indicated otherwise, the text in this article is either based on Wikipedia article "Symbolism (arts)" or another language Wikipedia page thereof used under the terms of the GNU Free Documentation License; or on original research by Jahsonic and friends. See Art and Popular Culture's copyright notice. This page was last modified 18:18, 28 January 2015. This page has been accessed 22,592 times.